I mentioned earlier this year that I wanted to simplify my life and part of that plan was doing a major closet clean out of everything I don’t wear. I was recently inspired to put a lot more energy into and expand this project. I attended an amazing session at South by Southwest (SXSW) called How Minimalism is Changing Entrepreneurship. This session had an amazing panel featured minimalists Joshua Millburn, Ryan Nicodemus, Courtney Carver, and Joshua Becker. They shared how being minimalists improved their professional and personal lives. It helped them promote what they valued and remove things that detracted from that focus. I know that I think more clearly and I feel more focused when my space is less cluttered. I get more work done in less time when I have fewer distractions. During the session, my head was buzzing with ideas and I was frantically writing notes on how I would put these ideas into action when I got home – like turning off my email and alerts on my phone when I’m working on other projects. 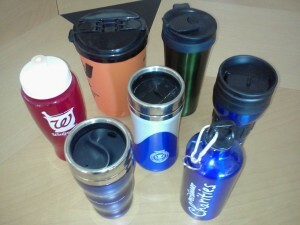 The bottles & travel mugs that were cluttering the cabinet. The thought of cleaning out my life has been so overwhelming that it’s prevented from cleaning things out in the past. During the minimalist session, I started breaking down areas of my home into manageable pieces. My plan is to tackle one section, drawer, or shelf every week. I wrote it all out and it will take me about six months to get through it all, and I’m ok with that. Garments that have been removed from my closet since January 1st. My first project was to clean out my closet rod. I’m in the process of cleaning out my wardrobe by reversing each hanger until I wear the garment it’s holding. 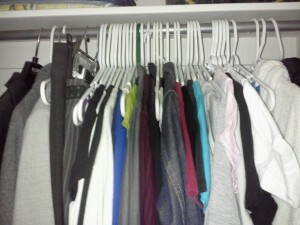 When I flipped my hangers, I removed 21 items from my closet because I knew those were items I probably wouldn’t wear again. I put them in the hall closet in case I was wrong. I went through everything that’s currently in my closet and tried on everything that I didn’t know for certain if it fit. I’ve lost 12 pounds since I started law school so some of my clothes were just too big. And there were some items that just didn’t fit my personality or my life anymore. I also found some garments that I thought were too big but actually still fit. I removed another 20 garments from my closet and put them in the hall closet. I have no plans of becoming a complete minimalist who only owns 100 possessions or someone like Andrew Hyde who gave up everything except 15 things. I just want to get rid of things that serve no purpose in my life anymore. It might be hard to get rid of things that hold sentimental value, but it’s just stuff. Giving an item a new home doesn’t take away the memories it has for me and it’s not doing anyone any good if it just sits in a box. I’ll keep you in the loop on my progress. Love this idea! I am trying to do this, too, and love your idea of writing out all the places to tackle and then do one a week! I am trying to remove 100 things from my life and so far am up to 20. Thanks Andrea! Good for you for cleaning out your life too. I like your idea of taking pictures of sentimental things. I was looking in my closet today and there are definitely somethings that only serve a sentimental purpose. I’m sure I’ll do a post about some of those items. 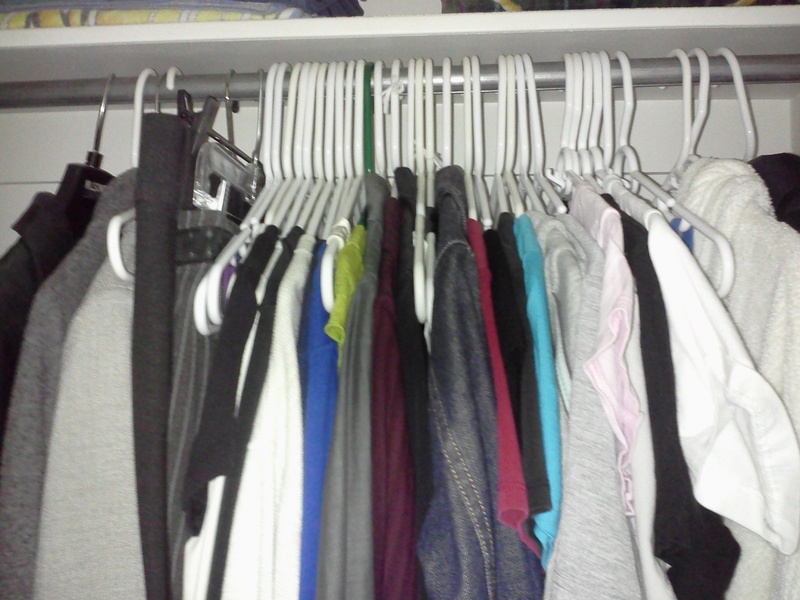 I have part of my closet for donations, and add to it regularly. I don’t take the pile to goodwill very often so it gives me time in case I made a mistake and really “need” whatever it is I thought I could do without — which almost never happens. I did use my donation pile for clothes to wear in Tough Mudder! What has helped me the most is when I am struggling with whether I “need” to keep something is to think “just let it go”. Sometimes even saying it out loud. Just let it go. I haven’t missed anything yet. Thanks for sharing Chad. I like the idea of putting my donation stuff in the hall closet because it gives me the experience of not seeing the possessions I’m going to get rid of so it’s like a trial run of living without them. By the time I make the trek to Goodwill, I’ve often forgotten about a lot of the things I’m donating. When I struggle with getting rid of an item I ask, “How does this thing make my life better?” Usually it doesn’t. I turned 60 years old in January & decided it’s really time to start making my life less complicated. I am doing a total clean out of my house & storage building. The past 3 weekends I have already accomplished a lot & it makes me feel 10 pounds lighter! My sister came to help with my clothes closets (best sister ever!) & that was the trigger I needed. Now I am going drawer by drawer, cabinet by cabinet until I get it all done. Don’t care how long it takes. We live at our place of business so all our office stuff is mixed in with our personal stuff. I want to feel that my life is less complicated so I can concentrate MORE on personal relationships, health, and faith. Good luck to you! Best of luck to yo as you clean out your life. I like your perspective of making your life less complicated. I’m already noticing that it’s making my mind feel like it can focus more. I just started this same “project” in order to minimalize my “stuff.” I have been reading a lot on minimalism and it makes so much sense to me. I am tackling a couple of things a week – yesterday I cleaned out the silverware drawers and the small buffet I have I did the same. It feels so good to get rid of stuff that just clutters my life. Here is hoping I can stick with it – but I think I will. Congrats on minimizing your stuff. I love the feeling I get every time I walk into my closet. I’m halfway done cleaning it out and it’s already making a huge difference. I can’t to see how it feels when the rest of the house is done. Clearing out my excessive travel mugs and water bottles was the inspiration start minimising my home/handbag/life. I have just started this month and have not yet tackled clothing. I love the idea of putting them in the hall cupboard for a “cooling off” period, and am definitely going to use it! That’s so funny that we started with the same items. I’m loving cleaning out my closet and I keep finding myself looking at stuff of my shelves and thinking, “That can go.” Best of luck to you with your clean-out project! I enjoy hearing about other’s journey in simplicity. I am in the midst of writing about a year-long mindful journey where I cover a different theme each month. In April I will be working through simplicity and I can hardly wait to start decluttering my house. I feel I spend so much time picking up (I have two small children who leave trails through the house  , searching for stuff, etc. I look forward to hearing how your simplicity vision progresses. Thanks for sharing! Congratulations on dedicating a year to simplicity and good luck with your own decluttering project! What a great post and goal for yourself! I have also tackled pursuing a more minimalist lifestyle this past year. I wish I had documented this process more but alas I did not! Although maybe this is for the best as when I have discussed openly getting rid of certain items on social networking sites, I have been surprised at some peoples responses! It actually made me hesitate to trash the item I was determined and perfectly comfortable getting rid of! Since last summer, I have donated and sold several car loads of stuff. The most surprising thing is that this practice has caused me to curb my spending dramatically because I remember when I bought x,y, and z item and how badly I “needed it” when I purchased it and now I am donating it. Waste of money! I also started with turning around every hangar in our apartment. At first, I thought this was ridiculous because I am a major clothes hoarder. I really thought I wore most of my clothes! I was really surprised to learn this was not the case – I bet I only wore 30% or LESS of my wardrobe. It has been truly liberating to get rid of the clothes that no longer serve me. Now my wardrobe is slowly being worked toward a place where every item serves a purpose to me and I feel good (and comfortable) wearing. Best of luck! Thanks! I wonder if people resist you getting rid of stuff because they’re uncomfortable with change. The only things I’m a little worried about are pieces of my Star Trek collection. Those pieces will be “re-homed” to other fans rather than simply donated to a thrift store or charity. Congratulations on making your life work better for you. Your plan on conquering the clutter in small focused tasks is a wonderful place to start! I wish you all the best in your journey ahead! Thanks Heidi! Breaking down my world into manageable chunks has definitely been helpful. You all have inspired me! I just came across this but had made a list last week of moving through each area of my home! JOY! I am going to use the trunk of my car as my “cooling off” location that way it is already out the door and will be easy to drop off and donate when I am fully ready to pass along my treasures to someone new. What a great idea Angie. I’m starting to run out of free space in my hall closet so I’m going to have to donate soon or find a second cooling off location. We have been trying to cut down on the clutter as well. For 2 people that live in a fairly average sized house we have managed to acquire quite a few things. The hardes things to get rid of have been the gifts. It is very hard as you do not want someone to take it the wrong way. Over the past 3 weeks we have donated 11 full trash bags of clothes to the goodwill, and this is probably just the beginning! We are planning on having multiple garage sales and eventually selling our house and hitting the open road! Thanks for the inspiration and a great way to tackle all of this! Good for you Chris. I had questions about gifts too. Joshua Becker shared that it may take people awhile to fully grasp what you’re doing. For Christmas, I give my family a list of desired gifts. I’ve given myself permission to not feel bad about giving away something that I didn’t ask for. I think it’s better that it go to someone who will use and value it rather than collect dust in my home. Oh honey – you lost 12 pounds since starting law school? Some (maybe most) might consider that a good thing, but I suspect you lost that weight due to the incredible stress you’ve been under. I feel your pain. Hopefully this is your first year and you’re just getting used to the whole law school routine. I promise you the last 2 years are MUCH easier. Your miminalistic approach to life is going to make you a fantastic attorney. You’ll be able to cut thru the clutter, literally and figuratively, much better than most lawyers. Best of luck! Don’t worry Jim – I’ve already graduated and am happy in practice. I’m also happy I’ve kept off the weight I lost in school. I’m hope becoming more of a minimalist will make me a better lawyer and a more efficient and calm person. Keep in mind, there is no set way to be an minimalist. It is better to find what works for you. Like yourself I cannot own 15 pieces of clothing, Or three plates. It is just not practical in my right now with a 14 year old. But I do other things that fits in what minimalist means to me. Yes, I am getting rid of a lot of stuff, living with much less,buying less and living my life to the fullest. Thanks Lynne. I don’t think of myself as a minimalist, but a person who applies the principles of minimalism to their life. I’ve only worked on my closet so far, and it’s already making me feel better. Life can be so simple but yet we fill our lives with clutter, clutter in our cupboards an wardrobes, clutter in our daily routines and mental clutter in our heads. It’s time to strip away all those unnecessary layers that modern life has bolted onto our daily routines and live a simpler, more fulfilling life of minimalism. If you want to enjoy another inspiring blog about how to live a simple, frugal, debt-free, minimalist life then please check out the http://www.thedebtfreeminimalist.com. Is the iPhone such a smart phone? Thanks for sharing! I’m definitely enjoying freeing up more space in my home.